Development of coal gasification plants in Indonesia for electricity and thermal energy supplies has been started officially since 2011. So far, two gasification technologies have been selected for demonstration, including two-stage updraft fixed-bed (Plant A) and twin-fire fixed bed gasifier technologies (Plant B). Economic analysis for electricity generation cost, selling price (with achieve ROI = 11% and 4 year loan installment) and tariff (with transmission cost added) as well as syngas generation cost as thermal energy analysis. . 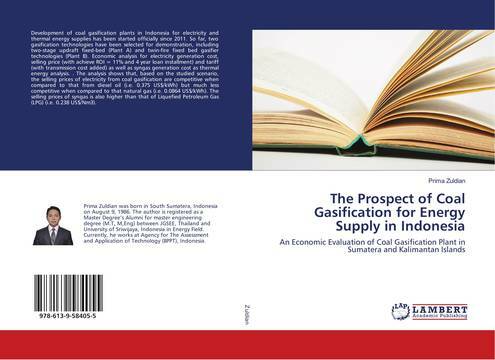 The analysis shows that, based on the studied scenario, the selling prices of electricity from coal gasification are competitive when compared to that from diesel oil (i.e. 0.375 US$/kWh) but much less competitive when compared to that natural gas (i.e. 0.0864 US$/kWh). The selling prices of syngas is also higher than that of Liquefied Petroleum Gas (LPG) (i.e. 0.238 US$/Nm3).